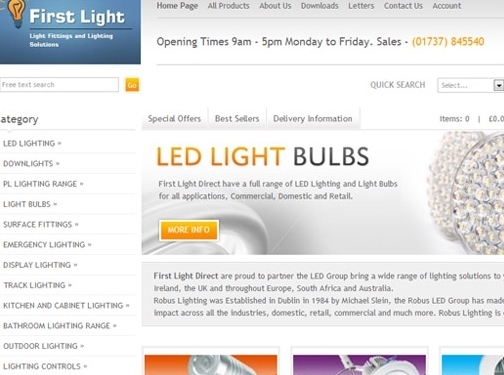 First Light Direct has been supplying Light Bulbs, Light Fittings and Fluorescent Tubes in the UK, for 25 years. We have always ensured that we only supply quality manufacturers and not cheap imports. We will not sacrifice quality in any way. JCC Stockists with all JCC products available from stock and delivered next day direct to you. Our lighting design team can help you choose the most suitable luminaires for your installation and assist with your lighting design, offering simple schedules and advice or computer-generated illuminance plots and graphics for larger projects. The very latest software is employed and allows JCC to give precise results from given data. JCC can also help you develop a 3-D lighting solution for both indoor and outdoor projects. Our lighting design team can produce a 3-D model of the project and will illustrate and report back the lighting results and effects on all surfaces within the model. This allows the scheme to be refined prior to any physical installation or capital outlay. Major projects may require an extensive report and JCC"s lighting designer team are able to offer more detailed information on the performance of your lighting scheme. UK (Betchworth) based company offering lighting products for sales. Website includes e-commerce features, delivery and returns information, terms and conditions, full company contact details.